The Magic Dolphin meets The Supervet! One of the events in The Magic Dolphin’s diary this year was to visit Dogfest, Windsor. Now, you’re probably wondering why a project all about dolphins would want to attend a festival that focuses on our four-legged friends? Well, the answer to that is that it’s not only a festival about dogs, it’s an event that celebrates and recognises ‘hope’. 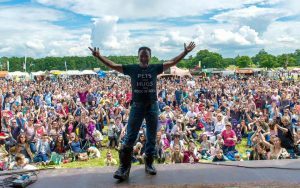 Dogfest is the brain-child of Professor Noel Fitzpatrick (AKA The Supervet). I shouldn’t think there are many animal-loving folk out there who haven’t heard of this man, or watched with intensity as he battles to save the lives of hundreds of much loved pets every Wednesday evening on Channel 4. 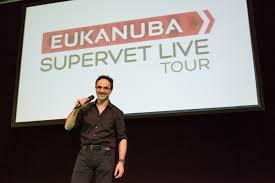 The Supervet has become one of the most popular animal documentary style programmes on British TV, and with reason! Noel Fitzpatrick works tirelessly from his veterinary establishment ‘fitzpatrickreferrals’ based in Surrey. He specialises in orthopaedics and neurosurgery on small animals, but recognises that cancer affects 1 in 3 animals (and humans), and wanted to provide a state of the art, world-class hospital to change the way that this disease is treated. His one-hour talk at Dogfest was inspiring to say the least. To learn about his very modest child-hood in Cork, Ireland, where he was brought up on his parent’s cattle farm. He told the audience that as a child he was bullied as he “could barely read and write” and his “only friends were dogs.” This is a true example of someone who had hope. He spoke about the atrosities going on in the world, about the violence, the terrorist attacks, the uncertainty we face as the human-race, the animal cruelty, and wildlife crime. He spoke passionately about the species of wild animals, for example rhinos, elephants, tigers, orangutans, whales and dolphins and many many more who’s lives are at risk every day due to poaching, deforestation, illegal hunting, fishing-techniques and more. It was a sobering hour, BUT he talked about hope. The love between humans and animals, the compassion we are capable of, the people who work their whole lives to provide conservation for endangered species, and the educators. The creative educationalists who go out to schools, clubs, societies etc to spread the word, and provide knowledge for the younger generations, in the hope that this knowledge will be passed on to further generations, before it’s too late! He also talked about the similarities of animal and human disease, and how he is contributing towards research and treatments for both! So, at the end of a very busy Dogfest, I got the chance to briefly meet with a very tired Professor Noel Fitzpatrick, to thank him for such an inspiring talk and to introduce my personal contribution to the world of conservation and animal welfare – hence a copy of The Magic Dolphin was placed into his hands, and a smile spread over his face. My message from this is NEVER give up hope. Lucy Hensure, the heroin in The Magic Dolphin, is based on a real-person who struggled at school, was bullied, and was picked-on by ‘friends’, but this only made her stronger, more determined, and will never give up hope. Take The Magic Dolphin Challenge! Welcome to our first VLOG!